Now that the Academy Awards are over and one of my favorite movies was shut out (and only nominated in one category), I want to alert everyone to see Bright Star, a lovely film directed by Jane Campion (The Piano, 1993). I know it’s not research, but we all love to watch movies. And there have been some very good ones lately – meaning in the last couple of years, such as The Duchess, and The Young Victoria (which did win one Oscar). Bright Star is the name of a poem John Keats (1795-1821) wrote to his true love, Fanny Brawne. Any lover of England, poetry, fashion, or film should adore it, though the ending is sad. And it has not a single explosion (except of emotion), not a vampire nor avatar, not a chase scene, no shooting, and no noisy soundtrack. It is beautiful and true. The stars, Ben Whishaw as Keats and Abbie Cornish as Fanny, are excellent, as is Paul Schneider as Keats’ friend and mentor Charles Brown. The whole cast measures up admirably. Although I am far from an expert on Keats, I found the film quite moving. And historically accurate, with beautiful settings and costumes. Except for one thing. As a good friend remarked, why didn’t they film it at the actual house where it all happened in Hampstead, just north of London? 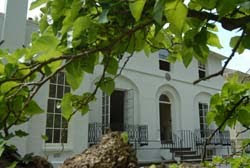 I visited the Keats House years ago and it is a treat! 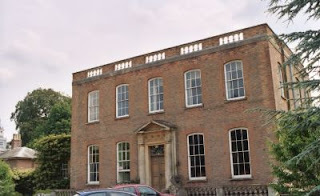 Here is the real house that Keats and Fanny’s family lived in. But, there must have been a good reason the producers used a different house, far from the congestion of Greater London. In Keats’ time, Hampstead would have been quite rural. Charmed by author Elizabeth Boyle’s sense of fun and spirit of playfulness, Victoria and Kristine accepted Elizabeth’s kind invitation to join her in a cyber tea. They dished and ate and dished some more about all things historical, about Number One London and about their upcoming trip to London. Elizabeth has put their conversation up on her website so that you can eavesdrop on all the fun. While you’re there, don’t miss taking a trip around the N.Y. Times best selling author’s witty website. Fine Grade II Listed Home – Designed by John Nash, this house was built by John Burton in 1825. One of the most handsome and successful of the terraces, its characteristic features are the archways which link the individual parts. As a lover of Jane Austen, I regret I could not attend the Morgan Library’s exhibition that just closed in New York City. I know several people who saw it and all of them were mesmerized by the display of letters and a manuscript in Jane’s hand. But in this age of the internet, we are fortunate to have wonderful resources right on our computer screens. So I encourage you to go to the Morgan site and feast your eyes on the films and exhibits available there. You won’t be disappointed. Below you see Jane’s Chawton Cottage in Hampshire as it appeared in May 2009, with its scaffolding. Substantial renovations were finished last year, 200 years since Jane Austen, Cassandra and their mother moved to the house. Jane Austen lived here for the last years of her life. Scholars seem to agree that she did her finest work here, both writing full novels and refining previous versions for publication. Visit Chawton Cottage here. One of the additions since I last visited a year ago is the reopened kitchen in which Jane helped to prepare breakfast. Now I have to go back. The Jane Austen Society of North America is thirty years old. Its current President, Marsha Huff, is a delightful friend and excellent keeper of the flame. JASNA’s next AGM, the annual meeting at which we talk nothing but Jane Austen for three days, will be held in Portland, OR, on the last weekend of October, 2010. Marsha and I are part of the JASNA Wisconsin chapter; we have many more excellent and accomplished members about whom I will be writing soon, right here at Number One London. Finally, I want to include a lovely picture used by the Morgan Library for their exhibit. 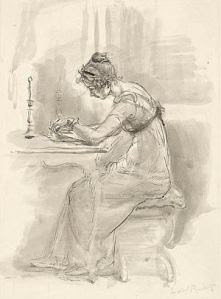 This is exactly how I think Jane Austen must have looked. I know this is exactly how I look when I am at my writing table. You too???? 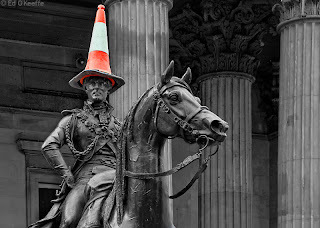 The Duke of Wellington’s statue in front of Glasgow’s Gallery of Modern Art (GOMA) on Queen Street has suffered continued indignity for at least the past twenty years. Sculpted by Italian artist Carlo Marochetti and erected in 1844, the Duke’s statue has been the target of late night revelers who all, after a few pints too many, think it would be the height of hilarity to place a traffic cone atop the Duke’s head. Often, photos of the latest rounds of such pranks make it into the local papers, to the great amusement of many Glaswegians. Now it seems that all that climbing up and down the statue has resulted in the Duke’s having lost his spurs and half his sword. As a result, the city council recently deemed the pranks to be criminal acts of vandalism and will seek prosecution of anyone caught attempting to place traffic cones on the Duke’s dome. I ask you! Author Kristine HughesPosted on March 23, 2010 Categories Duke of Wellington, Uncategorized13 Comments on It's Criminal!